In Rwanda, “Abadahemuka” means "trusted people". 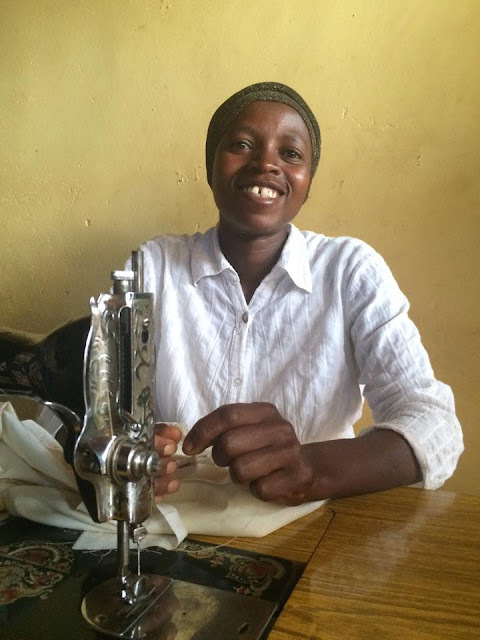 It's a fitting name for the individuals in Busekera who recently came together to form a sewing co-operative after receiving income-generating skills training from Food for the Hungry (FH) Rwanda. In addition to training, they also received sewing machines and start-up materials. This experience prompted 73 people to change their future. Before forming the co-op, these parents of FH sponsored children each worked alone - struggling to to provide for their families. So few people in the community had sewing skills that it was difficult for parents to even get school uniforms made for their children, let alone any other clothing. Those that did have tailoring skills lacked the resources to start a viable sewing business - it's difficult to get a hold of sewing machines, cloth, thread, and other notions in Busekera. FH Rwanda brought these parents together and provided them with the initial supports (training and supplies) they needed to start their own business. Working together, the co-op members are now able to generate enough profit to pay rent on the building where they have set up shop. With their income, they've even hired their own tailoring instructor to teach them advanced fashion skills - they’ve moved beyond simple school uniforms! Each member of Abadahemuka now earns a daily income of 3,000 Francs ($5CAD) per day. While it might not seem like a lot in the Canadian economy, this wage significantly helps parents feed and clothe their children, as well as save for the future. Working together like this has greatly improved the quality of life not only for the co-op members, but for young women, as well. The co-op recently reached out to 18 young women who have dropped out of school for family reasons. Girls who leave school early are often at a higher risk of unwanted teenage pregnancy, which can severely limit their future options. Abadahemuka has taken these girls under their wing and is teaching them tailoring skills at a low fee. From the "trusted people", these young women are acquiring skills that will help them earn a living and financial independence so that they can still have a bright future. To support sewing training for more communities, you can purchase a sewing machine.